How do you make a holy sanctuary, a place where God can manifest and be heard? God gives Moses instructions in this week’s Torah portion, Terumah (“Donations”). The instructions require the creation of both ritual objects (the ark, the bread-table, the lampstand, the outer altar) and the creation of ritual spaces through curtains. The Torah uses five different words for curtains in Terumah. The name of each curtain depends on its position in a sanctuary designed so that the holier and more exclusive the space is, the more it is covered and screened off. The outer courtyard of the sanctuary is accessible to all the people, walled off by curtains but open to the sky. It measures 50 by 100 cubits (roughly 75 by 150 feet, slightly smaller than an Olympic swimming pool). Inside the courtyard stands a tent sanctuary, called the “tabernacle” in English (from the Latin word for “tent”), and the mishkan, or “Dwelling-Place” for God in Hebrew. Only priests may enter the mishkan. 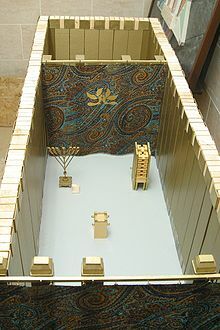 The innermost (western) chamber of the mishkan is the Holy of Holies. Only Moses and the high priest may enter the Holy of Holies, where God manifests as a voice above the ark and between the two keruvim, winged creatures hammered out of the two ends of the ark’s gold lid. The word kela-im occurs 16 times in the Bible, 15 times to indicate the linen hangings around the outer courtyard of the portable sanctuary, and once to indicate the carved double door into the great hall of the first temple in Jerusalem. The kela-im in this week’s Torah portion are made of a single material, twisted linen threads, undyed and therefore an off-white. The kela-im separate the outer courtyard, where all the people can gather around the altar, from the rest of the world. They are the boundary between holy space and mundane space. There is one entrance into the courtyard, a 20-foot gateway in the east wall covered by a hanging curtain. A masakh also hangs in the doorway of the mishkan, the tent inside the courtyard. There is only one doorway into the tent, an opening in the east wall. The curtain screening this doorway between the outer courtyard and the inner priest’s chamber has a different name. Both of these curtains separate a less holy space from a more holy space, and both hang loose so they can be pushed aside when someone enters or exits. They are both woven from linen, like the walls of the courtyard, but a design is embroidered on them in three vivid colors of wool. The word masakh appears 25 times in the Bible, all but three times referring to the hangings in the courtyard gate or the mishkan doorway. In the three exceptions, the word masakh is used for the cloth cover over a cistern (2 Samuel 17:19), for the metaphorical gateway to the kingdom of Judah (Isaiah 22:8), and for the cloud God spread over the Israelites when they left Egypt (Psalm 105:39). The walls of the mishkan are made of another type of curtain. yeriyah (יְרִיעָה), plural yeriyot (יְרִיעֹת) = curtain, panel of tent-cloth, tapestry. 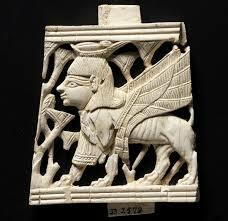 keruvim (כְּרֻוִים) = sphinx-like creatures with lion bodies, eagle wings, and human faces. Each yeriyah is four cubits (about six feet) wide—which was the standard width of an Egyptian loom. The linen and three colors of wool are all woven together into a tapestry with a design of mythical semi-divine creatures. Moses fastens together these tent-cloth panels into a ceiling for the tent-sanctuary. They are not as beautiful as the ones forming the walls, but they also face the holy space of the inner enclosure. The ceiling of yeriyot woven from goat-hair must be covered with another layer of roofing: a curtain of hides sewn together. The word mikhseh occurs in the Bible thirteen times, twelve times as the outer layer of the roof over the tent-sanctuary, and once as the roof over Noah’s ark. It serves as a sort of waterproof tarpaulin, covering and protecting the tent-cloth ceiling underneath. The fifth kind of curtain in the sanctuary is the partition that screens off the Holy of Holies from the priests’ chamber inside the mishkan. The word parokhet occurs 25 times in the Bible, always in reference to the partition screening off the Holy of Holies. The parokhet is woven of the same materials, with the same motif, as the walls of the mishkan. But it hangs so that Moses, Aaron, or the high priest after Aaron, can push it aside to enter the Holy of Holies and speak with God. By using five different words for curtains, the Torah portion Terumah emphasizes the importance of the different levels of holiness of each space that is partitioned, blocked from view, or protected. I think people also have zones of intimacy, each protected by its own barrier. To the outer world of strangers, we present a face like the blank white kela-im of the outer courtyard, without any designs or colors showing—except in the gateway, where our bland, socially acceptable surface is embroidered with a colored design indicating what our personalities might be like inside. When we make friends, we admit them through the gate into our outer courtyard, where they can see the sanctuary protecting our true selves. Our friends get a glimpse of our own vivid colors, and the mythological animals that indicate our particular life stories. But our inner self is still hidden and protected by yeriyot panels and by a mikhseh, a roof covering we hope is disaster-proof. Some people have never been inside the tent of their inner selves; they live only according to social roles and expectations, and find self-examination difficult. Others discover they have an inner priest who can enter the inner self and see what is inside. There, besides working with their own lamps and bread tables, they see the parokhet that screens off the Holy of Holies, where God might speak to them. These self-explorers might invite one or two people into the priestly level of intimacy. But only the individual can walk through the parokhet and see their own ark, and the keruvim that inspired all their woven and embroidered designs. Only an individual can see the empty space where the voice of God might manifest. Some individuals would prefer never to enter their own Holy of Holies, never to risk hearing a voice that comes from a deep place beyond the knowable self. How intimate do you want to become with yourself? With God? Which curtains will you pass through, and which will block your passage?